As leaders we are always on the lookout for ways to empower and grow our team. One of the classic ways to do this is to ask questions rather than assert our own viewpoint. Questions are powerful because they use pull communication, pulling the answer from individuals, which increases ownership and therefore commitment. By asking questions and listening to the answers, we can build relationships and create powerful teamwork. How can we save time by just asking questions? If I give you the answer, you may well forget the answer when you need the information again. If you get the answer for yourself, then you learn. Then the answer will reside within you until you need it again. Easy. By asking questions, we can empower our staff to make informed decisions, as opposed to just giving them an answer to their questions. “What options have you thought about regarding this?” is a great way to get people to think. Also, you don’t want to fall for the old “Upward-Delegation”** trick. By asking the person what they think they should do, rather than giving them the answer, they then search for the answer within, perhaps coming up with great alternatives. The best question I have ever run across? I have heard many great questions, however the best question is posed in Ken Blanchard’s bestseller, ”The One Minute Manager” I think is up there with the best. The One Minute Manager had asked for a report to be written by a team member and when the report arrived, he asked the team member, “Is this the best that you can do?” The team member replied that he could indeed improve it with more time. The One Minute Manager gave him more time. Again, he called the team member in and asked him if this was the best he could do? Once again, the team member replied honestly that he could tweak it a bit more if he had more time. The One Minute Manager gave him the time he asked for. 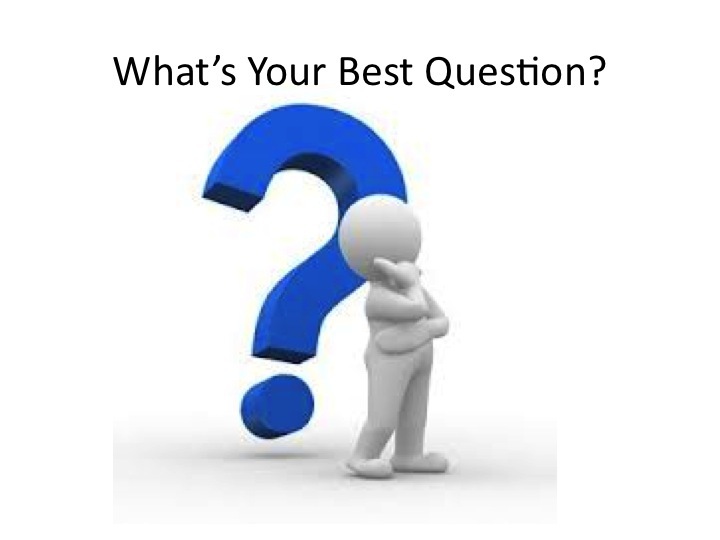 What’s the best question you have heard? Take opportunities this week to ask more questions of your team. Want an Expert Speaker at Your next Event? This entry was posted in Change Management, Communication, emotional Intelligence, Leadership, Performance Management and tagged coaching, decision-making, delegation, Development, Questions, Results. Bookmark the permalink.